22 January – Carl Oscar Strindberg, age 37, and Eleonora ”Nora” Strindberg, née Norling, age 26, have their third child, Johan August Strindberg. His brother Axel is about to turn 4 and Oscar is almost 2. He is the first child to be born after the couple was married – they had been engaged before. Nora has a lower middle-class background; she is the daughter of a master tailor and was working as a waitress at the Liljeholmen Inn when she and Carl Oscar met. At first she was his housekeeper. Carl Oscar – the son of Zacharias Strindberg, a successful spice merchant from the Jämtland Province – is described as sociable and steadfast. The family lives at Riddarholmshamnen, where Carl Oscar has his office and charters steamboats for passenger and goods traffic. He inherited the occupation from Johan Ludvig Strindberg, his brother and 17 years his senior, whom he succeeded as owner and chief cashier of the iron steamboat Samuel Owens, built in 1840. It is the first of its type in Sweden. Every now and then he also has various kinds of shops around Stockholm. Sweden is in the process of industrialising, and the new Companies Act sets the stage for railway, telegraph, gas pipe and other construction. But Europe is in upheaval. The year before saw the February Revolution in Paris, the March Revolt in Stockholm, the outbreak of the First Schleswig-Holstein War and the publication of Karl Marx’sManifesto of the Communist Party (Manifest der Kommunistischen Partei). Notwithstanding Strindberg’s portrayal in The Son of a Servant (Tjänstekvinnas son), he appears to have grown up in a stable, middle-class home with a domineering father who has an unusual attraction to beauty and culture (music, clothing, gardening) and a religious, fairly retiring mother. In the decade following his birth, a number of new siblings arrive (Eleonora in 1850, who presumably dies shortly thereafter; Olof in 1854; Anna in 1855; Elisabeth in 1857; and Nora in 1858), and the family is constantly on the move between apartments by Klara Church and country residences at Nortull. A bankruptcy in 1853 means temporary disaster, but household finances quickly recover. Strindberg starts school – first grammar school, followed by preparatory school and finally the Jakob Secondary Grammar School in 1860 at the age of 11. He and his brothers spend their summers as boarders at the houses of parish clerks in the countryside. Nora shows signs of tuberculosis in summer 1861. That autumn Strindberg enters Stockholm Lyceum, a private upper secondary school. Nora is bedridden as of January 1862 and dies on 20 March at the age of 39. Strindberg, who has just turned 13, experiences a religious crisis and adopts a pietistic Christian faith that seems to stick with him until his university years. Late that autumn, Carl Oscar (now 51) announces his engagement to Emilia Petersson, the family’s housekeeper and 30 years his junior. They marry and Emil is born some six months later. When he’s not in school, August earns money as a private tutor. He joins the Sharpshooters Association and has his first powerful experience of the archipelago – which he will use over and over in his writing – during an exercise on Tyresö. In 1867 he becomes the first member of his family to earn an upper secondary degree and goes to Uppsala to study aesthetics and modern languages. His studies don’t go well, and he interrupts them time and time again to take various teaching positions. Meanwhile he publishes his first newspaper articles, makes an unsuccessful attempt to embark on an acting career and starts to write plays. Sweden is modernising faster than ever. The Free Churches are on the march and the Church of Sweden is in retreat. Liberal, middle-class society is finally on the verge of taking over from the old class structure. The bicameral parliament (riksdagen) is established in 1866-1867. Dagens Nyheter (Daily News) is founded, grows quickly and is circulated throughout the country by rail. Leaving pigswill, dead animals or rubbish on the street is made illegal. Strindberg helps found Runa, an Uppsala club whose members borrow pseudonyms from Nordic mythology and encourage his literary aspirations. Writes his first known poems and continues to focus on plays. The Royal Dramatic Theatre accepts To Rome (Till Rom), a one-act play. The play Hermione is not performed but wins an honourable mention from the Swedish Academy. The Franco-Prussian War of 1870-1871 marks the end of the Second French Empire. Jules Verne publishes 20,000 Leagues Under the Sea (Vingt mille lieues sous les mers), Aleksis Kivi publishes Seven Brothers (Seitsemän veljestä) and Leopold von Sacher-Masoch publishes Venus in Furs (Venus im Pelz). Strindberg submits his bachelor thesis in aesthetics but receives only a mediocre grade – to his great chagrin. During the first summer, he rents a place on Kymendö with fellow Runa members Arvid Wickström, Joseph Josephson and Eugène Fahlstedt. (Den fredlöse). King Karl XV awards him a 200 kronor private scholarship. Strindberg leaves Uppsala for good in the autumn and moves to an apartment in Stockholm. He writes his first short story and paints his first painting. Works as a freelance journalist. Becomes acquainted with a group of young artists on whom the bohemian circle of Lill-Jans in The Red Room (Röda rummet) will be based. He writes Master Olof (Mäster Olof), but the Royal Dramatic Theatre turns it down. Begins to write for Dagens Nyheter. King Karl XV dies and his brother becomes King Oscar II of Sweden and Norway. Strindberg gets involved in the first of his many unknown loan intrigues: Shares a Riksbank (central bank) loan with two acquaintances. Publishes the Swedish Insurance Magazine (Svensk Försäkringstidning), closes down after six editions. Spends the summer on Kymendö drawing, painting and writing. Moves to Sandhamn in the autumn and considers becoming a telegraph operator. Continues to write articles and literature. Dagens Nyheter hires him but he quits in fury after five months. The krona replaces the riksdaler as the national currency. An economic crisis begins in Vienna and starts to spread. The world enters the Long Depression, which is not completely over until 1896. He writes the “middle version” of Master Olof (Mäster Olof). Obtains a position as an assistant librarian at the National Library of Sweden, still housed at the Royal Palace in Stockholm. Studies Chinese in order to catalogue a collection of writings. He publishes articles, works at the National Library of Sweden and substitutes as a teacher. During the summer he gets to know Lieutenant Baron Carl Gustaf Wrangel af Sauss and his wife Siri von Essen. Realistic drama makes its breakthrough at the Royal Theatre in Copenhagen with Bjørnstjerne Bjørnson’s A Bankruptcy (En fallit), which became a big European success. The Riksdag adopts the metric system, and the custom of setting up mileposts come to an end. A reform is adopted whereby everybody is to be addressed as “you” instead of by their title. Strindberg has a fiery confrontation with his father, probably because the business has been turned over to his brother, Oscar. Reworks Master Olof (Mäster Olof) again, this time in verse, but it is turned down too. Siri von Essen and Carl Gustaf Wrangel divorce. Strindberg goes to Paris, his first long trip abroad. Studies the impressionists but is critical of them. Siri von Essen makes a successful début as an actress at the Royal Dramatic Theatre. Strindberg studies Chinese with the intention of becoming a Sinologist, and he makes contacts in France. Writes a book of short stories entitled Town and Gown (From Fjärdingen and Svartbäcken). Marries Siri and they move to what is now Biblioteksgatan. Siri has a daughter whom they name Kerstin but she dies, probably the same day. Strindberg publishes a verse edition of Master Olof (Mäster Olof) and finances it himself – the reviews are mostly unfavourable. In the autumn he is unable to pay a guarantee commitment and has to declare bankruptcy. He and Siri have spent her entire fortune of 15,000 kronor (850,000 kronor by today’s standards). Adolf E. Nordenskiöld takes off on the Vega to find the Northeast Passage. The steam-operated Eldkvarn grist mill at Kungsholmen in Stockholm burns down in the Fire of the Century. Lars Magnus Ericsson starts to manufacture telephones. As a result of his Asiatic studies, Strindberg is elected to the Swedish Society for Anthropology and Geography and La societé des études japonaise, chinoises, tartares et indo-chinoises in Paris. Publishes The Red Room (Röda rummet), which is an immediate success. Moves to a three-room flat on Humlegårdsgatan. Henrik Ibsen’s A Doll’s House (Et dukkehjem) premiers as part of a well-coordinated move in all Nordic countries. The public debate on women’s duties swells to a storm. mileposts come to an end. Strindberg signs several book contracts and is elected to the Idun society. Siri has a daughter in February whom they name Karin. The family spends the summer on Kymendö. He starts to build a Nordic network and makes contact with Norwegian writer Alexander Kielland and Danish politician and writer Edvard Brandes. The decade’s big “morality feud” about sexuality, ethics and private life takes off in earnest. Strindberg signs a contract with Fritze’s book seller to the court for The Swedish People… (Svenska folket…) for the unheard-of sum of 10,000 kronor. Contacts Carl Larsson about illustrations and works with him during the summer on Kymendö. The book arouses fury because of Strindberg’s attack on Erik Gustaf Geijer’s historiography on the back. Siri leaves the Royal Dramatic Theatre at Strindberg’s urging. She has a daughter whom they name Greta. Nya teatern in Stockholm produces Master Olof (Mäster Olof), which turns out to be a hit. The Secret of the Guild (Gillets hemlighet) is performed in Helsinki – Strindberg’s first play abroad. He writes Lucky Peter’s Journey (Lycko-Pers resa) and Mr Bengt’s Wife (Herr Bengts hustru). Moves to Kymendö in late spring and builds a writer’s cottage. Publishes the satirical The New Kingdom (Det nya riket), which sparks an enraged counter-attack from conservatives. Edvard Brandes breaks with him because of the book’s anti-Semitism. The “Authors of the Eighties” make their breakthrough on a broad front. Carl Oscar dies. He and Strindberg had not seen each other for six years. Strindberg spends the summer on Dalarö and Kymendö. He publishes Poems (Dikter) for an unusually large fee. Goes with his family to Paris and the Nordic artist’s colony Grez-sur-Loing. Lucky Peter’s Journey (Lycko-Pers resa) is a hit at Nya teatern in Stockholm. He publishes a book of poetry entitled Sleepwalking Nights in Broad Daylight (Sömngångarnätter på vakna dagar). Anne Charlotte Leffler’s and Alfhild Agrell’s plays are performed in Stockholm, and Ellen Fries becomes the first Swedish woman to obtain a PhD (in history). Siri and Strindberg move to Switzerland. Strindberg publishes articles in French and Swedish. Siri has a son whom they name Hans. Strindberg writes Married (Giftas) in six weeks and is charged with blasphemy after publishing it. Goes to Stockholm, is acquitted and is hailed by his supporters while much of the public is enraged. Goes back to Switzerland. Verner von Heidenstam, also in Switzerland, gets in touch with him. Works of Strindberg are published in French, Danish and German translation. The family moves back to Grèz-sur-Loing temporarily. Strindberg starts on Married II (Giftas II). Ernst Josephson, Richard Bergh, Carl Larsson, Karl Nordström, Bruno Liljefors and others open an exhibition entitled “From the Shore of the Seine” at Blanch’s Art Salon in Stockholm in opposition to the Royal Academy of Fine Arts. Strindberg finishes Married II (Giftas II) and his reputation as a misogynist continues to grow. Writes Among French Peasants, Marauders, and the sequence The Son of a Servant, Time of Ferment, In the Red Room, He and She and The Author (Bland franska bönder, Marodörer; Tjensteqvinnans son, Jäsningstiden, I Röda Rummet, Han och hon, Författaren). Spends time with Verner von Heidenstam. Starts to tour France in order to obtain material for the second part of Among French Peasants but breaks it off after quarrelling with his travel companion and photographer. Takes a series of realistic snapshots of himself and his family. Strindberg remains extraordinarily productive and writes The Father, The People of Hemsö and A Madman’s Defence (Fadren, Hemsöborna, En dåres försvarstal).Publishes several articles about women’s emancipation in the Danish press and generates public debate. He and Siri decide in July to divorce. Moves with his family to Copenhagen in November. Opposition to the young authors grows in Sweden. Divinity teacher John Personne publishes Strindbergian Literature and Immorality among Schoolchildren (Strindbergslitteraturen och osedligheten bland skolungdomen); female authors in particular are subject to increasingly intense criticism. The protectionists in riksdagen (the parliament) take power from the free traders. Strindberg writes Life in the Skerries, Miss Julie and Creditors (Skärkarslif, Fröken Julie, Fordringsägare). He and his family stay at an estate in Skovlyst, Denmark, where a conflict with the bailiff and Strindberg’s relationship with the bailiff’s under-age half-sister gives rise to both literature and a trial. Founds the Scandinavian Experimental Theatre in Copenhagen to perform his plays. Receives fan mail from Friedrich Nietzsche and they correspond briefly before Nietzsche’s mental breakdown. Anne Charlotte Leffler moves to Italy. Victoria Benedictsson commits suicide in Copenhagen. Ernst Josephson has a mental breakdown. Verner von Heidenstam publishes Years of Pilgrimage and Wandering (Vallfart och vandringsår), his first book. Strindberg completes Among French Peasants and the play The Stronger (Bland franska bönder, Den starkare). Writes The Fifth Night (Femte sömngångarnatten) and the plays Pariah and Simoon (Paria, Samum). Starts By the Open Sea (I hafsbandet). The experimental theatre opens with Creditors (Fordringsägare) and Pariah. The premiere (a private showing) of Miss Julie (Fröken Julie) with Siri in the title role is held at the premises of the Student Society. Returns to Sweden and settles down on Runmarö. Breaks definitively with Siri and divorce proceedings begin. The Swedish Social Democratic Workers’ Party (SAP) is founded. The verse Master Olof (Mäster Olof) opens at the Royal Dramatic Theatre and a party is held for Strindberg at Hotell Rydberg. Strindberg writes in a letter that he had gone to a brothel ”in the same building where my wedding was held”. Begins to perform physics experiments. Moves around in the Stockholm area. Travels. Verner von Heidenstam and Oscar Levertin publish Pepita’s Wedding (Pepitas bröllop), a satire on the Eighties. Sweden’s first May Day demonstration is held. Approximately 150,000 people participate in 22 places around the country. Divorce proceedings with Siri infuriate Strindberg and they escalate into legal charges. Sets off for the Norrland province in August to write about the Swedish countryside but stops after Åre. Moves to Djursholm, where he rents various apartments. Artur Hazelius opens the Skansen outdoor museum. Selma Lagerlöf starts her career with The Story of Gösta Berling (Gösta Berlings saga), Gustaf Fröding with Guitar and Concertina (Guitarr och dragharmonika) and Per Hallström with Poetry and Imagination (Lyrik och fantasi). Oscar Levertin publishes Legends and Songs (Legender och visor). The writers of the Nineties make their breakthrough on a broad front. Writes plays and paints. Exhibits paintings at Birger Jarl’s Bazaar in Stockholm but receives mixed reviews and few sales. Resumes his experimentation with photography. Divorce from Siri is completed. He goes to Berlin and spends time with writers and artists at the wine cellar ”Zum schwarzen Ferkel” (The Black Pig), including Edvard Munch and journalist Frida Uhl. Paints a number of paintings. Munch paints his portrait. Starts on philosophical essays in natural history entitled Antibarbarus. Experiments with celestographs “without camera or lens”. Unexposed plates are put out at night and the dots of light are interpreted as correct images of the constellations. The opponents hold an exhibition in Berlin and Strindberg contributes several paintings. Marries Frida Uhl and goes to Austria to see her family. Birth of a daughter, Christine Kerstin, at Dornach. The Father and Creditors (Fadren, Fordringsägare) are hits in Paris. Goes to Paris. Breaks with Frida in a letter and she immediately initiates divorce proceedings. Hangs out in Paris with Knut Hamsun, Frank Wedekind, Henri Becque, Paul Gauguin and Julien Leclercq. Performs chemistry experiments. Exhibits some 20 paintings in Gothenburg along with those of Olof Sager-Nelson. Construction begins on Riksdagshuset (the parliament building) and Riksbankshuset (the central bank’s building). Publication of the French translation of “On the Inferiority of Women” (”Kvinnans underlägsenhet under mannen…”, ”L’Infériorité de la femme”) sparks an intense debate. Writes scientific essays and continues his physics experiments. Hospitalised and treated for hand eczema. Conducts research in a laboratory at the Sorbonne. Hangs out with the artist’s clique in Paris: Gauguin, Leclercq, Wladislaw Slewinsky, Alphonse Mucha, Fredrick Delius and Edvard Munch. Writes the foreword to a Gauguin exhibition. Contributes paintings to an exhibition of the Swedish Artist Society. Hjalmar Söderberg starts off his career with Aberrations (Förvillelser). Moves to Hotel Orfila and starts on The Occult Diary (Ockulta dagboken). Thinks that he has produced gold and gets in touch with alchemy circles in France, who greet him as a colleague and coworker. Goes to Austria to see his daughter Kerstin. Stays with Frida’s mother and her twin sister. Starts to study Swedenborg’s writings. Fröding goes on trial for indecency for his poem “A Morning Dream” (”En morgondröm”) but is acquitted. The first modern-day Olympic Games are arranged in Athens. Returns to Lund. Publishes articles about alchemy. Writes Inferno, a novel about his time in Paris and Austria. It is regarded as confirming that he is mentally ill. Goes back to Paris. Master Olof (Mäster Olof) starring Anders de Wahl is a hit at Vasateatern in Stockholm. The Public Art and Industry Exhibition is arranged on Djurgården in Stockholm. Salomon August Andrée embarks on a balloon expedition to the North Pole but crashes after three days. Writes the play To Damascus (Till Damaskus). Returns to Lund. Starts to discuss publication of his collected novels and stories with Gustaf af Geijerstam, the new senior editor at Gernandts. Émile Zola publishes the article “I accuse” (”J’accuse”) denouncing the French government for anti-Semitism and miscarriage of justice against Alfred Dreyfus. But Strindberg thinks he must be guilty because God is punishing him. The Swedish Trade Union Confederation (LO) is founded. Writes historical plays The Saga of the Folkungs (Folkungasagan), Gustav Vasa and Erik XIV. Gustav Vasa opens at Svenska teatern in Stockholm and may be Strindberg’s biggest hit ever. His 50th birthday; a celebration is held in Lund and by Gustaf af Geijerstam in Stockholm. Goes to Stockholm over the summer and stays there. Verner von Heidenstam’s “The Citizen’s Song” (”Medborgarsång”) criticises the requirement that people must earn a certain income in order to vote. Norway abolishes the union flag. The Second Boer War modernises warfare through the use of barbed wire, drabber uniforms and concentration camps for the civilian population. Writes Gustaf Adolf, Midsummer, Kasper’s Shrove Tuesday, Easter and Dance of Death (Gustaf Adolf, Midsommar, Kaspers Fet-tisdag, påsk, Dödsdansen). Meets Harriet Bosse for the first time at an audition for To Damascus. Spends the summer in Furusund. Quarrels with his sister Anna and her husband Hugo von Philp. Dance of Death is based on the couple. Ellen Key publishes The Century of the Child (Barnets århundrade) and Sigmund Freud publishes The Interpretation of Dreams (Die Traumdeutung). Marries Harriet Bosse on 6 May and moves into a 5-room flat on Karlavägen. She moves out after a quarrel on 22 August. Embarks on a painting period. Has contact with Austrian theatre director and innovator Max Reinhardt. Queen Victoria dies and is succeeded by King Edward VII. In Sweden compulsory military service is adopted, art nouveau is introduced. The first Nobel Prize in literature is awarded too Sally Prudhomme instead of Leo Tolstoy. Swedish writers, including Strindberg, protest. Writes Gustav III and Fairhaven and Foulstrand (Fagervik och Skamsund). Max Reinhardt produces several plays in Berlin. Protests, demonstrations and strikes for universal suffrage grow in size and intensity. A tax return is introduced for Sweden’s first general income tax. Josef Conrad publishes Heart of Darkness. Harriet Bosse initiates divorce proceedings. Oscar Levertin writes a highly unfavourable review of Dance of Death (Dödsdansen). Scania in Malmö exhibits Sweden’s first car produced on an assembly line. Bjørnstjerne Bjørnson receives the Noble Prize in Literature, Pierre and Marie Curie in Physics. First flight of the Wright Brothers (37 metres). Writes the novel Gothic Rooms and the satirical novel Black Banners (Götiska rummen, Svarta fanor). Gets to know artist Carl Eldh. Divorce from Harriet Bosse is finalized but their relationship lasts for another three years. His sister Elisabeth dies on 10 December. He doesn’t attend the funeral. Anton Chekhov’s The Cherry Orchard (Вишнëвый сад)premiers at the Moscow Art Theatre. Emigration from Sweden to North American declines from 42,000 in 1930 to 18,000. Miss Julie (Fröken Julie) is performed for the first time in Sweden (privately at Uppsala Stadshotel). Dance of Death (Dödsdansen) premiers in Cologne and tours Germany. Comrades premiers at Lustspieltheater in Vienna. Carl Eldh does his first portrait of Strindberg. The new Swedish Riksdagshus (the parliament building) opens on Helgeandsholmen in Stockholm. The architecture is heavily criticised, partly because the connection between Lake Mälaren and the Baltic Sea is severed. A labour dispute leads employers to accept the freedom of association and minimum wages. Norway declares that its union with Sweden has been dissolved. Writes The Roofing Feast, The Scapegoat and A Blue Book (Taklagsöl, Syndabocken, En blå bok). The Crown Bride (Kronbruden) premiers in Helsinki with Harriet Bosse in the lead. Miss Julie (Fröken Julie) has its first public performance in Sweden – produced in Lund by August Falck, followed by a tour. Old spelling is abolished in schools and public documents. The Swedish Academy Glossary is to be the basis for all spelling from now on. Henrik Ibsen dies at 78 and Oscar Levertin at 44. Selma Lagerlöf publishes The Wonderful Adventures of Nils (Nils Holgerssons underbara resa). Björck & Börjesson agree to publish Black Banners (Svarta Fanor) and become Strindberg’s most important publisher for the next few years. The character assassination in it causes widespread indignation. Writes chamber plays Thunder in the Air, The Burned House, The Ghost Sonata and The Pelican (Oväder, Brända tomten, Spök-Sonaten och Pelikanen). Founds, with August Falck as manager, Intima Teatern (The Intimate Theatre) at Norra Bantorget in Stockholm. Opens with the premiere of The Pelican, which is a fiasco. A Dream Play (Ett drömspel)premiers at Svenska teatern in Stockholm with Harriet Bosse as Indra’s daughter. Tries to document recurring cloud formations during his morning walks. Those are his last photographs. Writes new parts of A Blue Book (En blå bok). Carl Larsson discovers his portrait under ”Fictional Characters” and considers murdering Strindberg. A series of plays open at Intima Teatern but the reviews are mixed and the audiences are small. Begins systematic language studies. Moves to Blå Tornet (The Blue Tower) on Drottninggatan in Stockholm. The new Royal Dramatic Theatre on Nybroplan in opens with the verse Master Olof (Mäster Olof). Three young socialists in Malmö blow up the Amalthea carrying English scabs. One man is killed, 23 injured. A campaign is launched against pulp literature. In their battle against the ”cultural filth”, conservative pundits try to include Hjalmar Söderberg among the morally reprehensible. Writes his last play, The Great Highway (Stora landsvägen). Turns 60 and is courted by the Social Democratic Youth of Sweden in his apartment. Sven Hedin’s return from his voyage of discovery to Tibet is jubilantly celebrated. Heidenstam turns 50 and accepts a “national tribute” at Övralid by students with banners in a torchlight procession. Awarded an honorary doctorate. Riksdagen (the parliament) approves universal suffrage for men and raises the voting age from 21 to 24. An artist’s group called The Youth (De Unga), including Isaac Grünewald, attracts much attention with a new exhibition. Filippo Tommaso Marinetti publishes his futurist manifesto in Le Figaro: ”’a racing car is more beautiful than the Victory of Samothrace”. 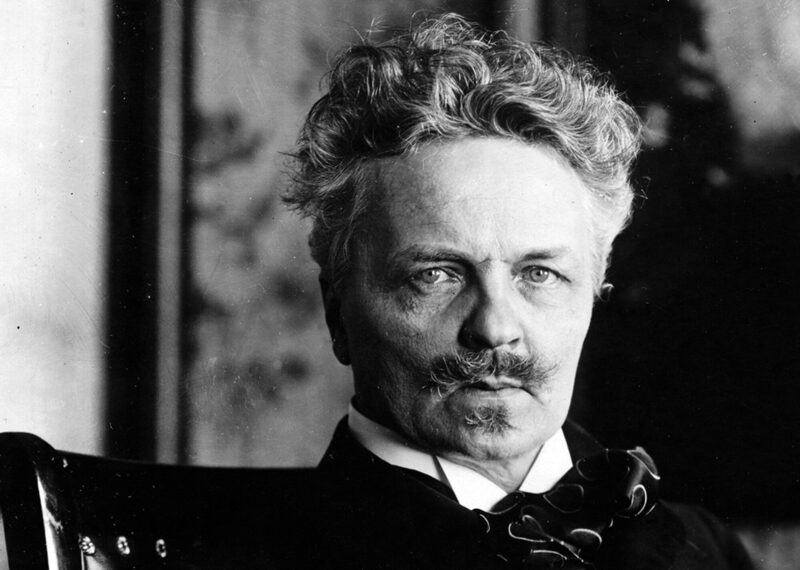 Publishes an article entitled “Pharaoh Worship” (”Faraon-dyrkan”) in Afton-Tidningen on 20 April, the first in a series that sparks the “Strindberg Feud.” Three hundred pundits make 465 contributions over a period of 16 months. The actors at Intima Teatern rebel against poor working conditions and unpaid salaries. Strindberg attacks August Falck in the press. The theatre gives its last performance on 11 December – Miss Julie (Fröken Julie) with August Falck as Jean and Manda Björling as Julie. The People of Värmland (Värmlänningarne), the first Swedish feature film, premiers. Signs a 200,000 kronor contract with Bonniers for the rights to his collected works. Nathan Söderblom tries to nominate Strindberg for the Nobel Prize but is told that he is too late. Gustaf Fröding dies. 200,000 people watch the procession. An election to the Second Chamber of the Riksdag is held for the first time following the new voting regulations. The Conservatives lose significant support while the Social Democrats receive more than 28% of the votes. Karl Staaff forms a new Government as the Social Democrats and Liberals have a majority of seats in the Riksdag. Bonniers begins to publish his Collected Works (Samlade skrifter) in 55 volumes. Publication is completed in 1921. Fifty thousand people celebrate Strindberg’s 63rd brithday with a torchlight procession organised by the Stockholm branch of the Social Democratic Party. His stomach pain gets worse in late March. The last photograph of him is taken in a snowstorm on Drottninggatan on 9 April. He is diagnosed with stomach cancer and dies on the morning of 14 May. His children Greta, Karin and Hans sit at his bedside. Strindberg is buried at Norra kyrkogården on 19 May. Crowds line the street and the procession from Blå Tornet is followed by thousands of people. Members of labour organisations have more than a hundred banners. In September, Max Reinhardt’s epoch-making, expressionistic production of Dance of Death (Dödsdansen) premiers in Berlin.